Ripe Persimmons ready to be picked! 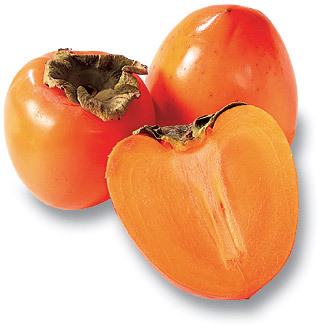 There are two main species of persimmons, the Oriental Persimmon (or Kaki) and the American Persimmon. The persimmon fruit can range from yellowish-orange to dark reddish-orange. The fruit size can range from the smaller American Persimmons (about 1/2 inch diameter, about the size of a cherry tomato) to the larger Oriental Persimmons (up to 4 inches diamter, about the size of a medium tomato). The texture of a ripe persimmon can range from jelly-like and almost dripping from the cut fruit to much dryer but still soft, almost like a firm melon or a soft apple. When not quite ripe, some persimmons have a lot of tannins and can be very bitter or dry, but when ripe, the persimmon is rich and honey-sweet with a spicy apricot flavor. Persimmons can be categorized as Astringent or Non-Astringent. Astringent Persimmons have that bitter-dry, chalk-like taste to them before they are ripe. American Persimmons and astringent Oriental Persimmons are astringent, and they should be allowed to ripen on the tree or picked underripe and allowed to ripen. When ripe, the skin becomes soft and the skin is almost translucent, and the fruit will easily separate from the calyx. Non-Astingent Persimmons or Non-Astingent Kakis (since only kakis can be non-astringent) are ripe when the fruit is fully colored. They will still be firm at this point, but are ready to eat. 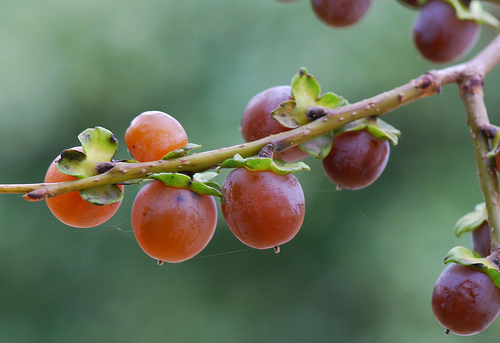 The Date Plum is a tree with berries less than an inch in diameter. 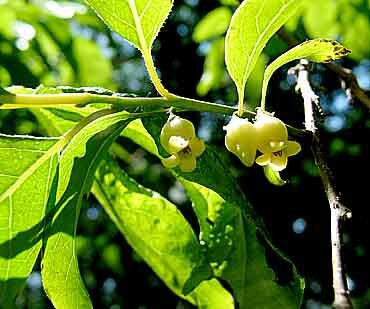 It is one of the oldest cultivated plants. It is from these fruits that taste like a mix between a honey-filled date and a sweet plum, that the name Diospyrus originates (see Trivia below). 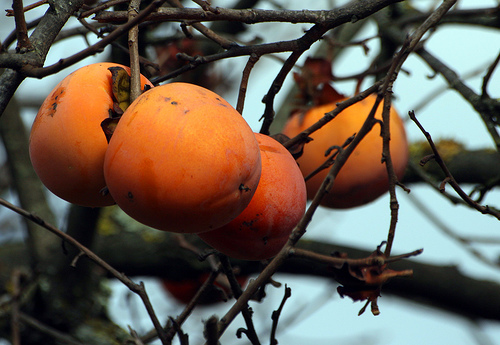 The Oriental Persimmon is native to China but spread very quickly through all of Asia. It has been cultivated for thousands of years and was only brought to Europe and the U.S. in the early 1800’s. The Date Plum is native to southeast Europe and southwest Asia and has been cherished since before the time of the Greeks. The American Persimmon is native to the eastern U.S. and has been used for its wood and fruit for thousands of years by Native Americans. The scientific genus name, Diospyrus, means “fruit of the gods”… not a bad description of a perfectly ripe persimmon. Persimmon fruits are technically berries. One Oriental Persimmon variety is commonly sold as “Sharon Fruit”, named after a plain in Isreal where the plant was cultivated. There are over 2,000 varieties of Persimmons in the world. 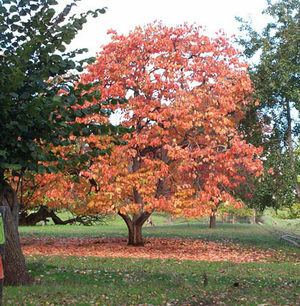 Beautiful American Persimmon tree in late autumn. Fresh Eating – only eat ripe fruits! Cultivars/Varieties: Thousands of varieties are available. Use only named varieties for best flavor. D. kaki may need cross-pollination. Pollen may come from a separate male tree or from a male flower that randomly blossoms on a primarily female tree. NOTE: Pollination levels can change the character of the fruit. There are some prized varieties ofgoma (the Japanese word for these brown fleshed fruit that are eaten when still firm). Tsurunoko, sold as “Chocolate persimmon” for its dark brown flesh, Maru, sold as “Cinnamon persimmon” for its spicy flavor, and Hyakume, sold as “Brown sugar” are the three best known. The Date Plum… fruit of the gods! American Persimmons are one of the few plants that tolerate juglone, a chemical produced by black walnuts that can poison other plants, so American Persimmons can be used as a buffer plant between your black walnuts and your other forest garden plants. Propagation: Seeds (2-3 months stratification). Grafting. Underripe fruits have been very rarely associated with a very rare condition, the formation of Persimmon Bezoars. These are accumulations of undigestible polymers from a persimmon specific tannin. This only happens with extremely high consumption (one man ate over 2 lbs daily for 40 years!). These phyto (or plant based) bezoars traditionally were only removed via surgery. More recently drinking Coca-Cola to break the chemical bonds of the bezoar has been used. Amazing! 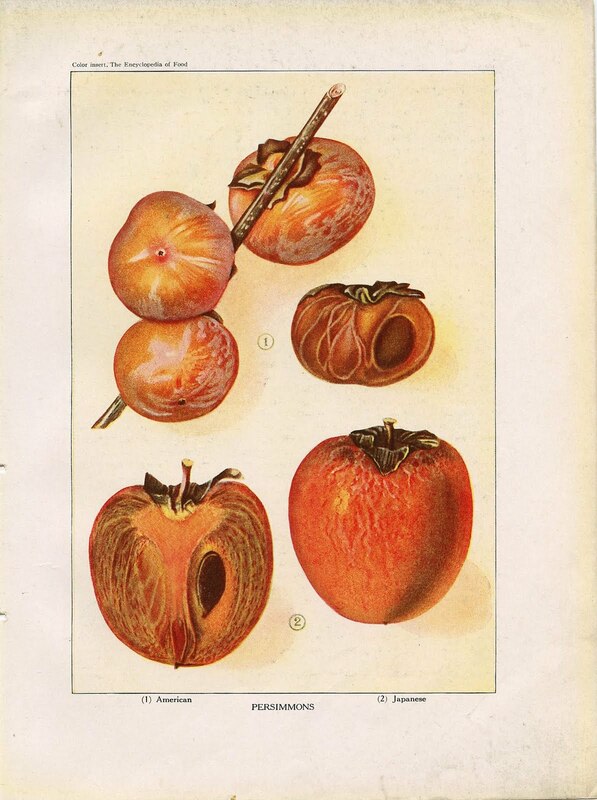 Classic illustration of American Persimmons (above) and Oriental Persimmons (below). From the Encyclopedia of Food.